The Penthouse project is about precision, architectural control, artful graphic layout and transitions from interior to exterior. Located on the 27th and 28th floors of a residential tower, the Penthouse has two terraces which were designed with different programmatic functions based on relationships to interior spaces, directional orientation and predominant skyline or sunset views. 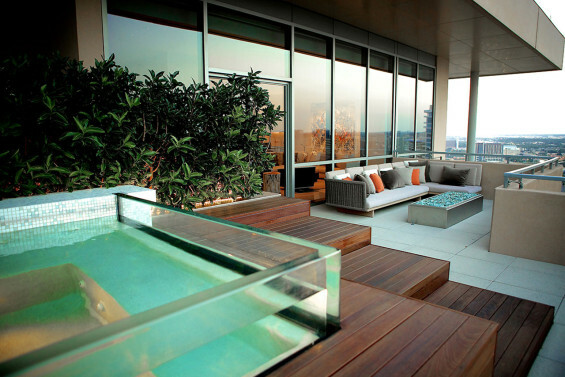 On the east terrace a spa and a fire pit are backed by Downtown views. With adjacencies to the primary living space with full glazing the west terrace enjoys views of the Trinity River corridor, its iconic Calatrava-designed suspension bridge, and great sunsets. The programmatic features along this terrace include a water feature, outdoor kitchen, and dining area. 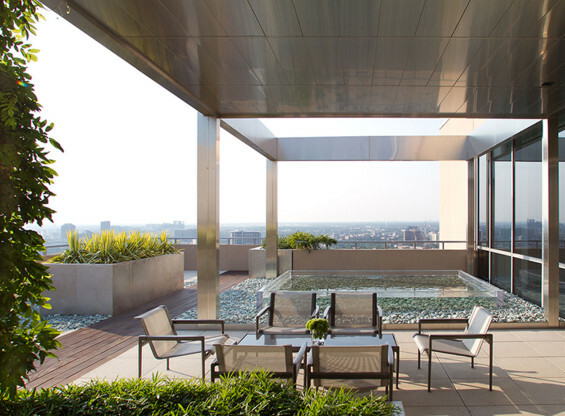 The east terrace includes a dominate design feature, an ipé cube, that cradles a spa while providing access and rest, as well. The space combines both active and passive uses, form and function. The site-built architectural cube serves as an enclosure to a spa with a transparent solid resin wall that allows the water to become a visual animator of the space both during the day and night due to its transparency. The ipé cube folds down on one side to become a series of steps for access to the spa. The opposite side subtly bends into a fluid, sculptural lounger whose sinuous curve creates a comfortably elegant place to relax with view of the Dallas skyline beyond. 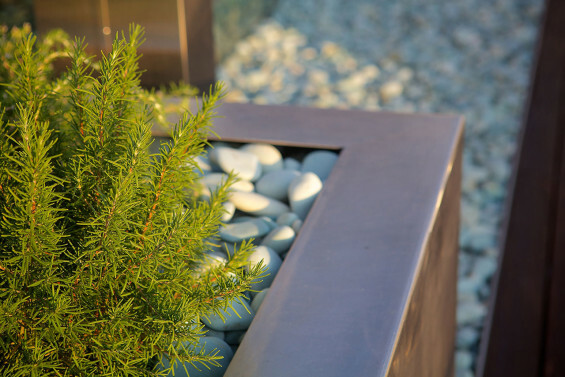 Custom designed stainless steel planters and a stainless steel fire pit were integrated into the space as perimeter elements and accents, respectively. 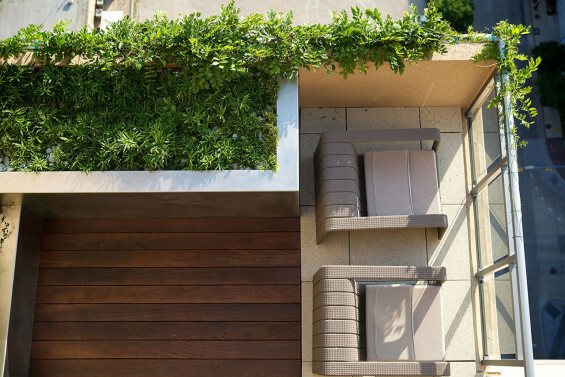 This multi-function design maximizes the small terrace as a very livable, resort-like space. On the West Terrace, the same approach to both active and passive use is followed. 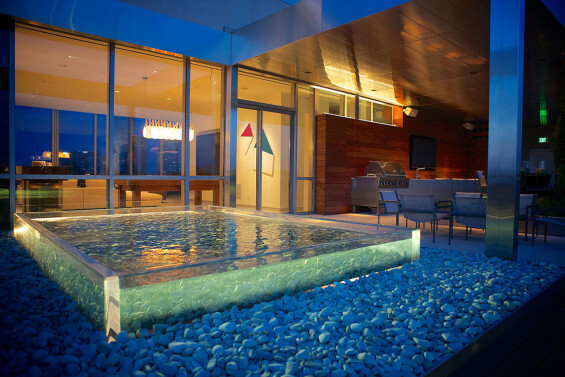 A backlit, cast resin water feature holds liquid in a beautiful, transparent suspension. The water of this reflecting pool is slightly agitated to create visual interest, and at night the water animates the entire space with reflections. 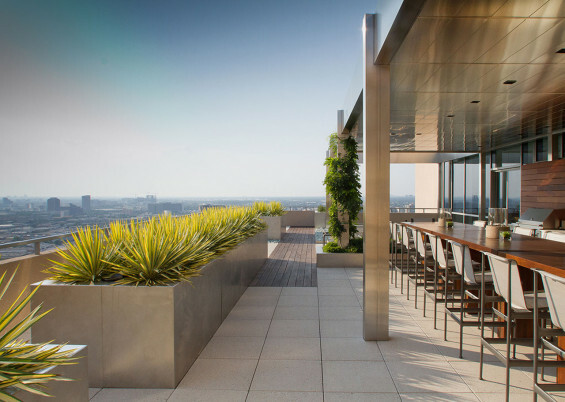 Stainless steel planters cut through the space defining circulation and outdoor rooms along the spacious terrace. A plinth of jade pebbles appears to seamlessly pass through the resin walls to define the space architecturally. An outdoor kitchen and dining space were integrated for an open-air experience with expansive views beyond. The glazing of the penthouse visually dissolve in the night’s darkness and the interior and exterior spaces unite into a glittery continuation of indoor/outdoor living space. To capitalize on this effect, much of the Penthouse design was conceived with an understanding of evening use. The look and feel of the terrace and its interior adjacency during these hours became the prevalent theme. 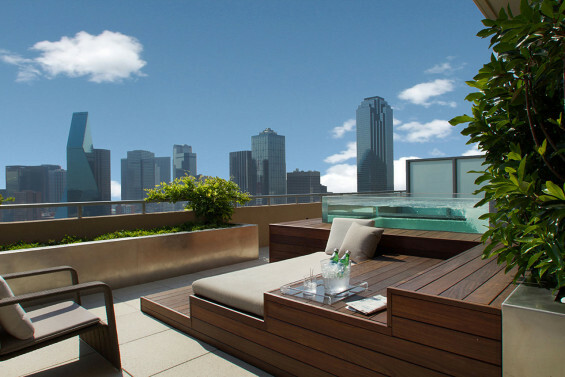 The harsh environment of a 27th and 28th floor residential tower terrace determined other design choices, including hardscape and landscape materials. 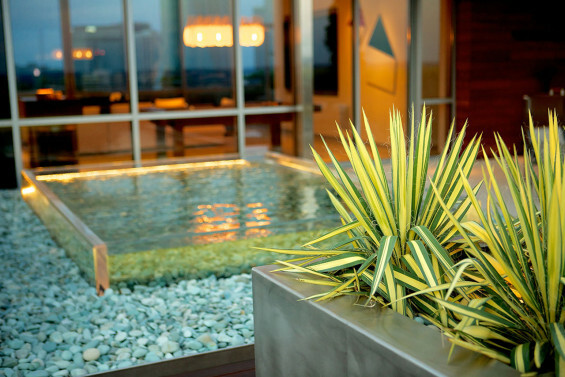 Cozy and comfortable seating areas were designed to offset the winds on the high terrace, and a minimal, adaptive plant palette was chosen for visual impact and durability in this manmade microclimate. This project was characterized by the limitation of transporting all materials up to the 27th floor. Dimensions of non-site-built elements were taken so that all fit within the confines of elevators and stairs. Careful planning and staging for the future install determined design features from the beginning. Surprise from the streets: Art!